Since we rented a movie from a Redbox last night we had to take it back today. We had to pick up something from the Walgreens on Whites and Westnedge anyway so that’s the one we went to. I wasn’t planning on stopping for lunch while we were out, but as we were pulling in to the parking lot, J brought up Big Apple Bagels. She just got a handful of gift cards and offered to share with me. 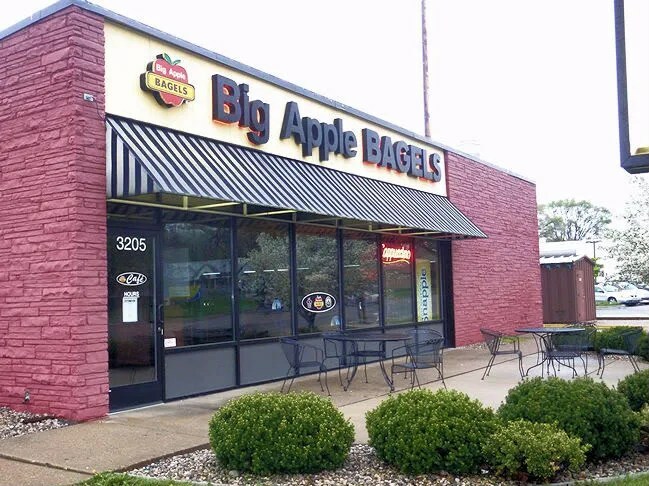 There are two Big Apple Bagels locations in Kalamazoo. We were right next to the store on South Westnedge near the Cork Street intersection. The store is pretty close to the road and from Westnedge, there is a little alleyway that you could enter. The parking lot is in the back and accessible from Cork Street. The entrance most people probably use is in the back of the building. It’s right off the parking lot, but there is an entrance on the Westnedge side of the building. When it’s nice out, there are tables outside so you can enjoy your bagel in the sunshine. 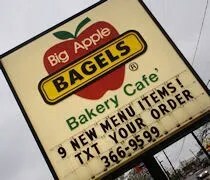 Before J brought it up, I had no idea Big Apple Bagels had a cafe menu. 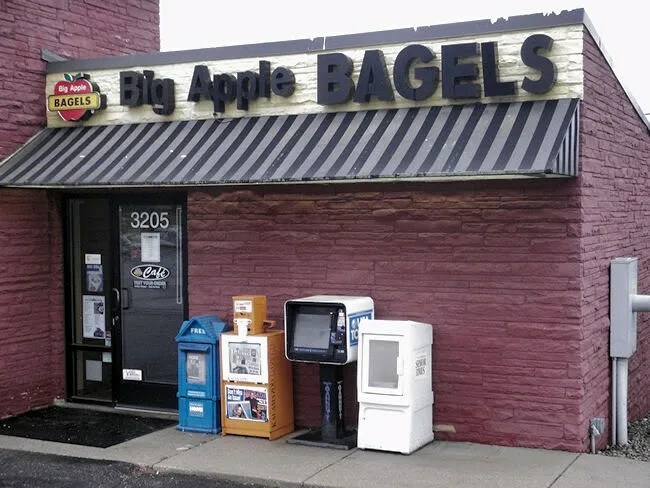 I always assumed it was just coffee and bagels. J stops there quite a bit in the morning to pick up coffee and/or breakfast. I had never been inside a store before. The set up is pretty much like most coffee shops. There’s an order counter with a display of bagels and loafs of bread they call Twists. There are a few tables spread out in the rest of the space, but I assume a big chunk of their business is carry-out. J ordered first and got the Turkey and Havarati on a bagel. The sandwich is smoked turkey, havarait cheese, lettuce, tomato and an onion and chive cream cheese. 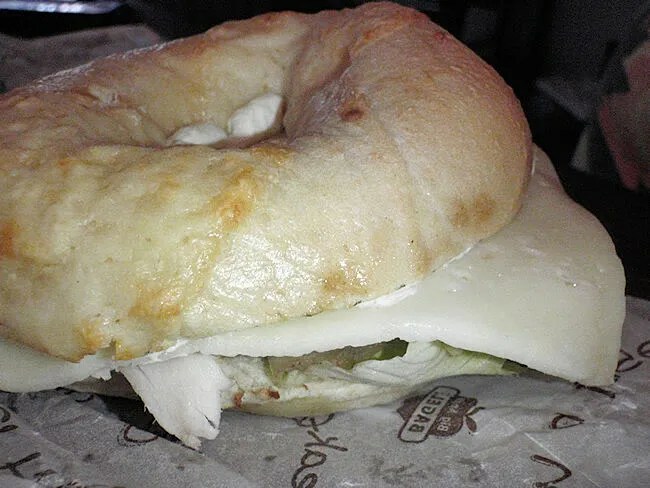 The sandwich was more bagel than filling, but she seemed to like it. She didn’t say a whole lot so I don’t know much other than she seemed happy and ate the whole thing. She also got a chilled coffee drink of some kind. I’m not a coffee drinker, so I never remember exactly what she gets. I ordered the Roma Italian on a Cheddar Parmesan Twist. The meats include ham and salami then it’s topped with lettuce, tomato, red onion, Provolone cheese, and a vinaigrette dressing. I opted to leave off the onion and tomato. The sandwich was wrapped in two halves and neither were huge, but they were stacked pretty well with the fillings. 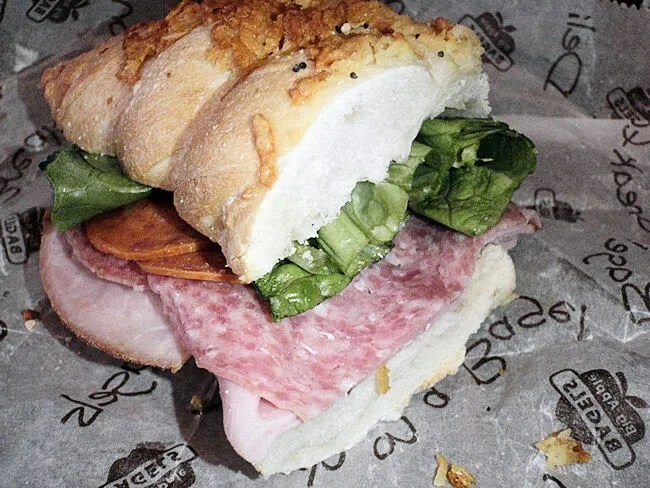 The sandwich is a pretty simple deli sandwich, but the choice of bread added a bunch of flavor. The cheese was baked on to the top of the bread and it had a pretty strong cheese taste. My sandwich was good, but nothing really out of the ordinary. It’s definitely something I would eat again and if I was the type of person to stop for coffee, the deli sandwich option would probably bring me in to BAB over a regular coffee shop. The cost of the two sandwiches and a drink was just over fifteen bucks. That didn’t include any type of side other than a pickle spear, so not really on the cheap side. Still, it is a pretty good sandwich in a concept that is much better than just a coffee shop.